Tangible opportunity costs of buying on credit. Intangible opportunity costs of buying on credit. Enter the amount you still owe on the debt, but without the dollar sign or any commas. Due to compounding interest, the amount you owe cannot be arrived at by simply multiplying your payment amount by the number of payments remaining. You may need to call your lender to find out the exact amount you owe. Enter the annual interest rate percentage you are being charged for the debt, but without the percent sign (for .18 or 18%, enter 18). Enter the amount of your current monthly payment. Enter as a dollar amount but without the dollar sign and any commas. Choose whether your monthly payment is a Fixed amount, or a Declining minimum payment amount. Enter the rate of return you expect to earn on your investments. Enter as a percentage, but without the percent sign (for .04 or 4%, enter 4). Based on your entries, this is the number of payments you will need to make in order to pay off this debt. Based on your entries, this is the total interest charges you will pay between now and when you pay off this debt. If you would have paid cash for what this debt was used to purchase, and invested the avoided interest charges, this is what your investment would be worth for the same time period you would have been making payments on your debt. This is the difference between what you will pay in interest charges on this debt, and what you could have earned with the interest savings if you had not created this debt in the first place. 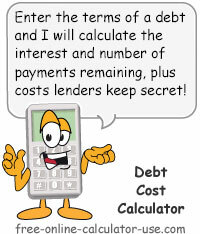 This calculator will calculate cost of debt in terms of the interest you could be earning on the interest charges you are paying. Plus, the calculator will also show you what your investment would be worth had you invested the principal instead of borrowed it. If you're not sure what is meant by "opportunity costs", be sure to visit the Learn tab before using the calculator. Enter the current balance owed on the debt. Enter the annual interest rate being charged by the lender. Enter the current minimum monthly payment amount. Indicate whether you are making a fixed monthly payment, or a declining minimum monthly payment. Enter the percentage rate of return you expect to earn on your investments. Click the "Calculate Debt Cost" button and scroll down to view the results. What opportunity costs are, both tangible and intangible. If you're not familiar with the term "opportunity cost," then shame on our public educational system. Why? Because an acute understanding and awareness of that term is critical to the amount of financial happiness you will experience in your lifetime. If you don't know what they are, opportunity costs are the values of what you give up by choosing one course of action over all other alternative actions, and can be tangible, intangible, or both. Let's first discuss the tangible opportunity cost of debt. Purchase something else of equal or lesser value. In the case of choosing to spend the money rather than invest it, the tangible opportunity cost would be equal to the amount of interest you could have earned on that money if you invested it for a designated period of time (less than or equal to the remainder of your life, or that of your heirs). In the case of large-ticket purchases, the opportunity cost of lost interest earnings can be staggering! Now, if turns out you don't have the cash to purchase a product or service you desire, then of course you can choose to buy the product or service on credit. If that's the case, then not only are you giving up the right to earn interest on the money used to purchase the product or service, but you are also giving up the right to earn interest on the interest charges you will now be forced to pay rather than invest. Now, did your lending institution ever bring that fact to your attention? Of course not. In the course of borrowing money for non-essential, non-appreciating products and services, other opportunity costs arise that cannot be quantified -- and therefore cannot be used to calculate the cost of debt. Here are a few of the most common intangible opportunity costs of buying on credit. Having easy access to credit gives you the false impression that you can have it all. As a result you're not likely to take the time to determine which basket of products and services will bring you the greatest emotional returns. If you were forced to pay cash for everything you purchase you would instantly begin getting higher emotional returns from the same amount of money being spent. Since it's much quicker and easier to solve a problem by throwing borrowed money at it, having easy access to credit tends to thwart our natural problem solving abilities. If you were forced to pay cash for everything you purchased you would be totally amazed at the number of problems you could solve with little or no expenditure of money (decreased opportunity costs). When you buy on credit you are basing your decision on how much money you are earning now, and on how much you enjoy your present work. However, because you cannot know what the future holds, for all you know you might be repaying the debt on half the income you are making now after being forced to work at a job you hate. If you knew now that halfway through your debt repayment you would lose your job and would be forced to dig trenches by hand in 110-degree heat -- for half what you are earning now -- would you still decide to create this debt?